"Changing the typical PC into a fashion accessory"
MSI has announced the launch of its new Wind Top AE2020, an all-in-one PC with a 20-inch widescreen touch display. 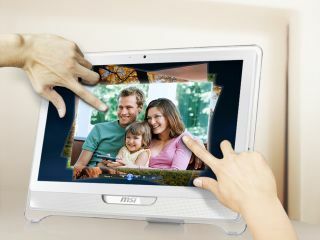 The Windows 7 PC features a multi-touch screen, with a 16:9 aspect ratio for watching movies and viewing multiple windows. Style is apparently important here, with the Wind Top packing a leather exterior - but under the hood there's also an Intel Pentium T4300 dual core processor. While the screen is full HD compatible, there's sadly no Blu-ray player on board, so you'll be stuck with normal DVDs. However, with an HDMI port you'll be able to plug hi-def video on the monitor, and an Nvidia Ion graphics processor will at least make things look swish. At £599, it's a reasonable buy, but with the touchscreen PC market really starting to heave at the moment it will be tough to make an impression this Christmas. But if this kind of model really tickles your fancy, it should be available any day soon.